1 Rinse chives and shake dry. Cut into thin rings. 2 Season cream cheese with a little salt and pepper. Divide cream cheese into two bowls. 3 Into one bowl of cream cheese, stir in the chives. Stir the paprika into the remaining cream cheese. 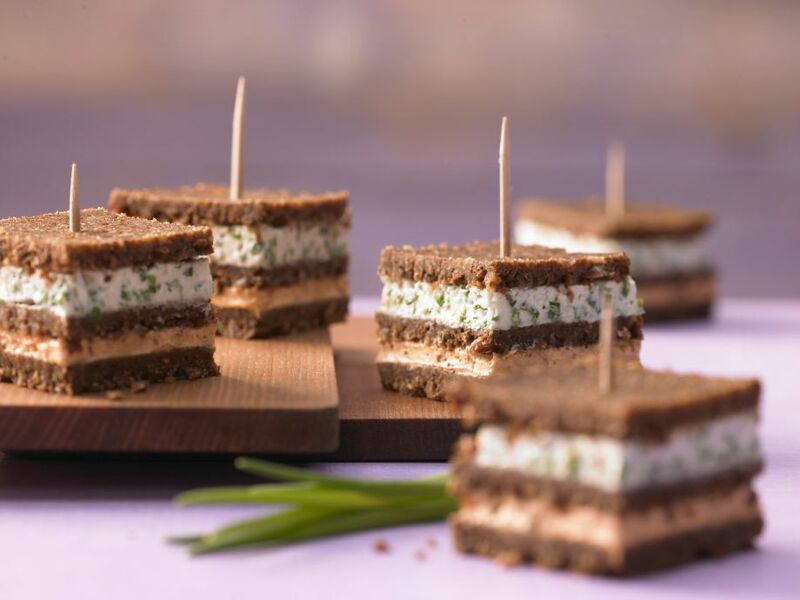 4 Thickly spread the chive-cream cheese mixture on 2 slices of pumpernickel. Thickly spread the paprika-cream cheese on another 2 slices of pumpernickel. 5 Stack a paprika slice on top of a chive slice and top with a plain slice of pumpernickel. Repeat with the second set of bread slices. Press the stacks down firmly. 6 Secure the stacks with 6 evenly spaced toothpicks. Cut each stack into 6 cubes.